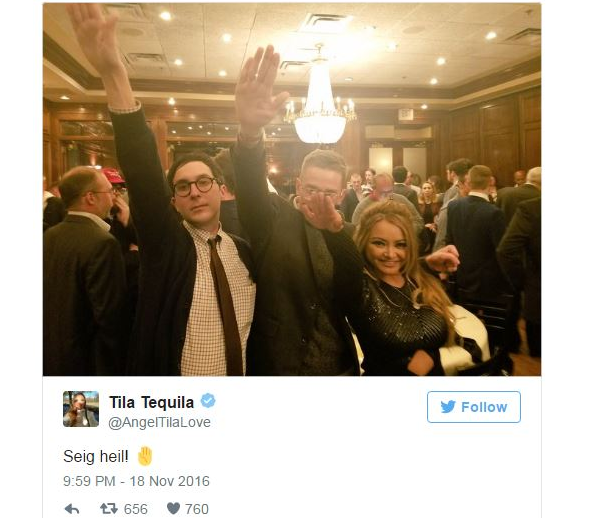 Tila Tequila has used Twitter for racist rants and hoards of other inappropriate things (see our slideshow below), but it was the Sieg Heil celebrating Adolph Hitler that was the final straw. The photo has since been removed, as Twitter suspended Tequila for her inappropriate and hateful speech. I’m honestly surprised it took them this long. And what makes her Nazi-fueled hate any different than any of the other racist rants she’s been on? I think Twitter needs to take a closer look at their content policies because, in my humble opinion, no hate speech should ever be condoned. The National Policy Institute is a white nationalist organization that is know for celebrating Hitler and advocating for white supremacy. They were also vocal supporters of Donald Trump in the election. According to the Washington Post, the restaurant where the event was held, Maggiano’s Little Italy in Northwest Washington D.C. has since apologized for allowing the event to take place at their location. “This was a last-minute booking made Friday afternoon, and the reservation was made under a different name, therefore we were not aware that NPI was dining with us or what the group represents,” a representative from the restaurant told The Post. As for Tequila, she thinks people need to chill out. “I’m obviously not white and I think it’s so funny to get a rise out of people who are so easily triggered by things like that,” Tequila said in an interview with The Tab. “I like to be a bit more fun. And a lot of people are missing out on that point. We’re actually preserving the freedom to be able to speak online and do these things, that’s important. Just as protesters have the right to protest, we have the right to things like that. It’s important to preserve these rights. I could start ranting about how Tequila is missing the point entirely and is so blind it’s infuriating, but I think any rational-minded person understands that this line of thinking is detrimental to society. I’ll just say that any message that spreads hate and not love is one we should avoid at all costs. Do you think Twitter should make harsher restrictions against hate speech?